Jeff Warschauer can be seen with the Klezmer Conservatory Band. His superb solo album, The Dancing Waltz has also been reviewed on these pages. Living Traditions, 430 West 14th St., Suite 514, New York, NY 10014, USA. Tel: 212-691-1272 / Fax: 212-691-1657. Me redt un me redt un me shushket zikh. Khaveyrim, azoy fil reyd vegn Mandy Patimkins CD, tsi er tseharget di shprakh tsi nit, tsi zayn stil iz mer Yidishlekh tsi mer Brodvey? Vayzt oys az mir Mendelyaner zaynen nit beser vi der durkhshnitlekher Amerikaner in gas. Mir zaynen farkokht mit dem CD dafke vayl er iz fun a "Holyvud star." Ikh hob zikh nokh nit tsugehert tsu Mandy Patimkin's CD, ken Ikh nit zogn kin meyvines, tsi er toyg yo tsi nit, ober Ikh meyn az s'iz shoyn tsayt mir zoln gebn a bisl mer ufmerkzamkeyt a nayem CD vu mer darf nit fregn tsi di zingers kenen rikhtik aroysredn Yidish, vayl zey kenen, un vu me darf nit fregn tsi der stil iz oytentish oder nit. Ikh red do vegn dem nayem un shtark sheynem CD fun kinderlider, Grine Katshke! Di zingers, Perl Teitelboym un Lorin Sklamberg mit klenere uftretungen fun Adrienne Cooper, Henry Sapoznik, un a grupe yunge Yidish-redndike kinder zingen ale rikhtik, fun gut iz opgeredt! Di muzikalishe aranzhirungen zaynen lebedik un farsheydnartik, un azelkhe vos kenen farkhapn kinder. S'rov fun di lider zaynen frier in ergets nit rekordirt gevorn (af vifl Ikh veys). Es zaynen do say alte, gut bakante lider vi "Grine Katshke," "Di Frosh" un "Sorele iz in Vald Avek" vi oykh naye shafungen fun Beyle Shekhter-Gottesman un Josh Valetsky! Ale lider zaynen vegn khayes. Lomir oykh nit fargesn tsu dermonen di zeyer sheyne papirshnitn fun Odem Vaitman vos bagleytn yedes lid in bikhl. Khotch der CD iz getsilt af kinder vet yederer vos hot lib Yidishe muzik hanoye hobn. Me ken im bakumen fun Living Traditions oder fun der Yidish-Lige. A yasher-koyekh ale onteylnemer! They said it couldn't be done! A record of children's songs that didn't include "Afn Pripechik" or "Yome, Yome" but they were wrong! "Grine Katshke" (The Green Duck) is a wonderful new CD of Yiddish songs for children, all on an animal theme. 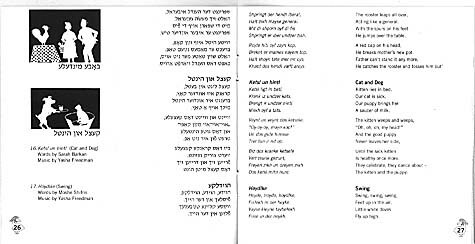 There is no need for discussions about whether these singers--Paula Teitelbaum, Lorin Sklamberg, Adrienne Cooper, Henry Sapoznick, and a delightful group of Yiddish-speaking (not just singing) children can pronounce Yiddish correctly! They can! The material is fresh and lively and the style is a wonderful mix of authentic and original. You don't have to be a kid to enjoy the Grine Katshke, you just have to be young at heart! I might only add that while Lorin (Klezmatics), Adrienne (solo, Kapelye), and Henry (Kapelye) have work that has been reviewed quite positively on these pages (and as often as I can! ), Queens-based Yiddish teacher Paula Teitelbaum might be less familiar to readers of these pages. She is the Yiddish teacher from whom I learned at KlezKamp, where she appears regularly. She is a wonderful teacher. Now we know that she can sing, as well. Henry and Lorin run Living Traditions, the wonderful folks who brought us this CD. I also need to call attention both to Adam Whiteman's living papercuts that grace the album throughout. An artform for which Eastern European Jews were renowned, it is a very welcome affirmation of context to see them here. That they are really neat, helps, too. I also want to note the attention that was paid to the typography, aligning everything in the friendliest, "let's help people follow along" fashion possible, with the Yiddish to the left of the transliteration, lines aligned, so kids (and adults just learning Yiddish) can most easily use both without eyes getting lost; and the English on the far right of the spread for those who wish to translate. Like everything on this album, it is just all so well and thoughtfully done, and the results are so very, very much fun. This is an album that catches the fun and specialness of being a child. That it happens in Yiddish is even better. Di grine katshke Songbook is an 80-page publication featuring musical transcriptions and guitar chords for all 25 songs on the recording, with expanded notes and games related to the theme of the collection, all enhanced by large reproductions of Adam Whiteman's beautiful papercuts.